This report is for the old villages before the 1.14 snapshots. See MC-140727 for the same bug with the new 1.14(+) villages. 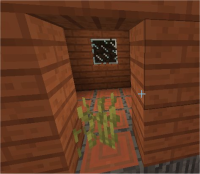 Grass can generate inside a villager house. That doesn't seem right. MC-106749 Bad generated village structures. MC-109342 Big dirt walls in Large village house.